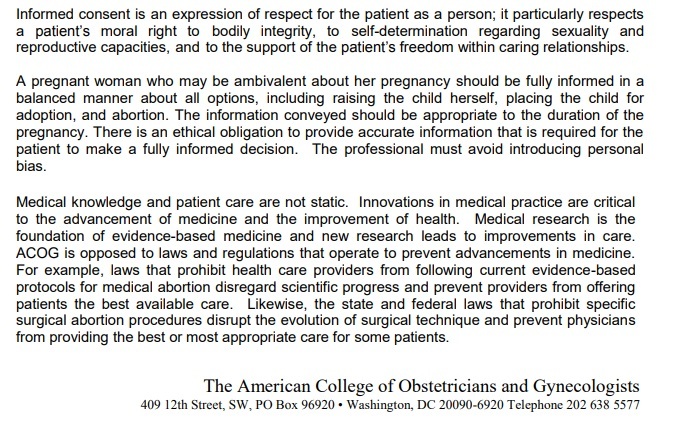 The American College of Obstetricians and Gynecologists isn't neutral. It's pro-abortion. 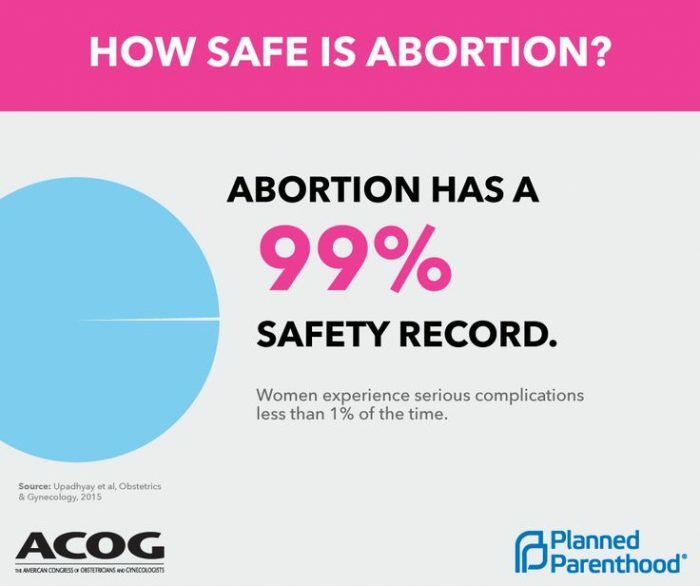 It should be no secret that the American College of Obstetricians and Gynecologists (ACOG) is pro-abortion. 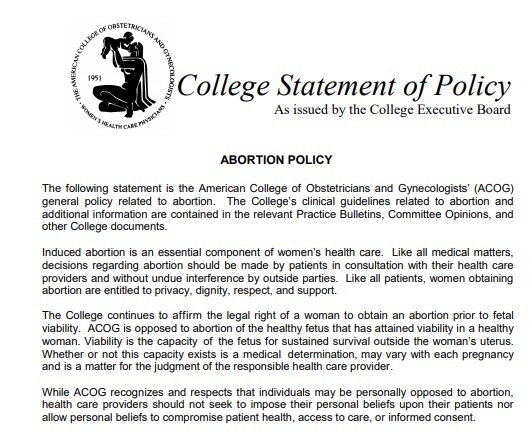 In 1966, members of ACOG moved to liberalize abortion laws and by 1968, the College’s executive board approved one of the most liberal abortion policies of any professional medical organization to date, according to a report by the New York Times. In 2017, ACOG’s Executive Vice President, Hal C. Lawrence, MD, co-wrote an opinion piece published by the Annals of Internal Medicine praising the work of Planned Parenthood. The ACOG VP suggested that defunding Planned Parenthood would hurt women despite the fact that Planned Parenthood has been caught covering up and enabling child sexual abuse. A report recently published by Live Action details how young children were taken to Planned Parenthood where they should have been protected but were instead, giving abortions and often returned into the arms of their abusers. In April, ACOG granted former Planned Parenthood president Cecile Richards its Lifetime Advocacy Award. It was presented by incoming ACOG president Lisa M. Hollier, MD, who states her focus will be on reducing preventable maternal mortality. ACOG recently issued a statement claiming that pro-life abortion pill reversals are, in its opinion, “not based on science and do not meet clinical standards.” The organization’s political arm, ACOG Action, opposed the HHS “Protect Life Rule” change prohibiting tax dollars from funding abortion counseling within the federal Title X family planning program, because ACOG claims it “undercuts access to safe, legal abortion.” Title X also requires recipients report child abuse, something Planned Parenthood has failed to do on multiple occasions, as previously mentioned. More revealing proof of ACOG’s abortion advocacy comes directly from its so-called “Practice Bulletins” on abortion, which were developed with the help of abortion providers. 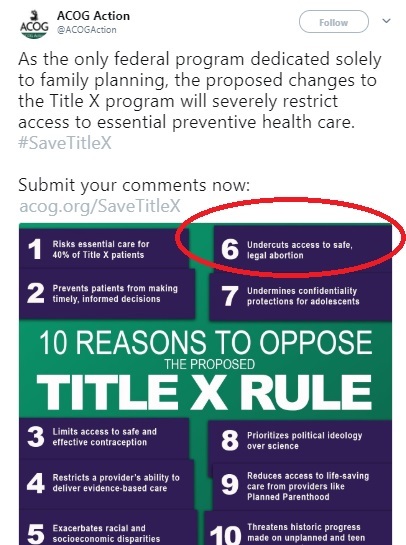 Case in point, this bulletin (seen in the image below) on first trimester abortion was “developed by the Committee on Practice Bulletins—Gynecology and the Society of Family Planning with the assistance of Mitchell D. Creinin, MD and Daniel A. Grossman, MD,” all of whom are deeply tied to abortion. 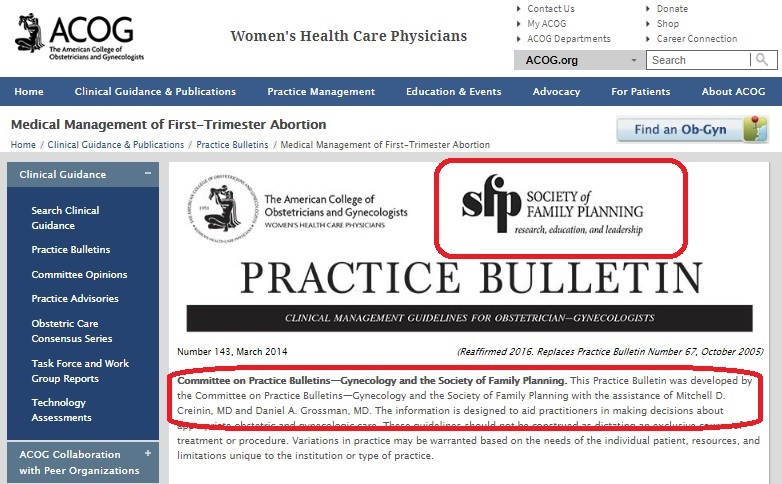 ACOG’s partnership with the Society of Family Planning (SFP) is especially troubling. 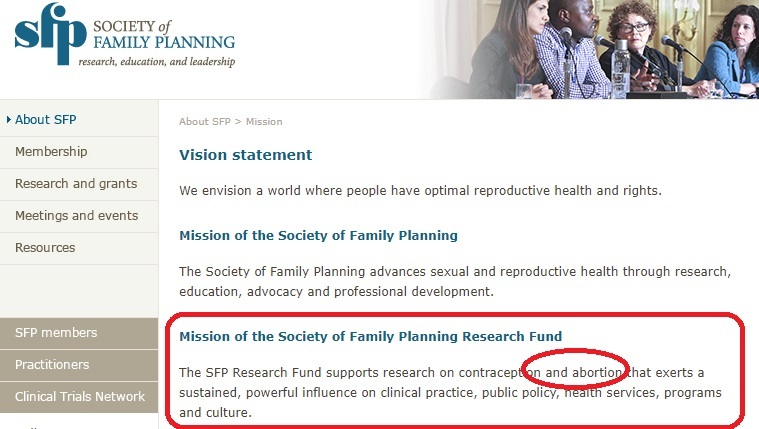 SFP has a mission to support research on contraception and abortion and also funds the Guttmacher Institute, a former “special affiliate and research arm” of Planned Parenthood. In addition, as Live Action News has reported, SFP pledged support of Planned Parenthood during the fetal body parts congressional investigation. Oxford University Press describes Creinin as the medical and lab director of Planned Parenthood of Western Pennsylvania. He is also listed among the advisory counsel for an early abortion training guide published by Advancing New Standards in Reproductive Health (ANSIRH), part of UCSF’s Bixby Center for Global Reproductive Health. As Live Action News previously reported, ANSIRH’s founder, late abortionist Felicia H. Stewart, is known to have been a physician on staff with more than one Planned Parenthood, and is credited with the introduction of the “Plan B” pill. She also led the push for midwives and nurse practitioners to commit abortions in California and served on the boards of NARAL Pro-Choice America and the National Abortion Federation. 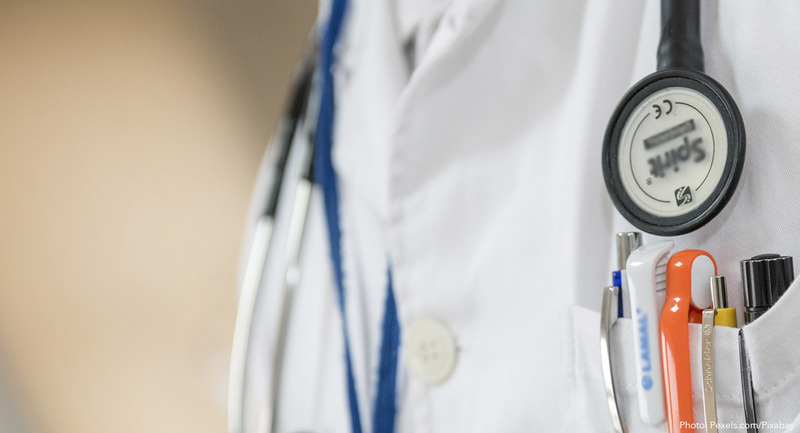 The second physician involved in ACOG’s abortion bulletin is Daniel Grossman, who also had an association with the manufacturer of the abortion pill. According to Grossman’s own testimony before a United States District Court in 2014, he provides clinical services, including abortion, as a consultant to Planned Parenthood Shasta Pacific, and serves as a liaison member of the Planned Parenthood Federation of America National Medical Committee. Grossman has also served on the board of NARAL Pro-Choice America. Given the ACOG’s collaboration with abortion providers and unabashed praise of abortion, it is crystal clear where its alliances lie, and it is not with the pregnant woman and her preborn child. As such, all studies and information from the ACOG should be viewed with suspicion.